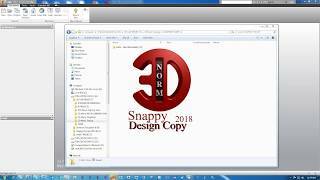 Snappy Design Copy is an application for Autodesk® Inventor® users who are spending quite some time on renaming files when using Vault Basic or iLogic Design Copy. Snappy Design Copy also comes with very useful renaming features that are not available in Vault Basic or iLogic Design Copy; renaming a project number is done instantly for the whole project. Snappy Design Copy works with all Autodesk Inventor versions from 2015 and above. External links in assemblies and parts will be updated, Excel files will be copied and the references in the new assemblies, weldments, presentations and parts will be updated. •No more renaming Component for Component. Renaming a whole project, including drawings (Optional: and sheet names) is done with only 2 or 3 selections, 2 pieces of information and 1 click. •Add a Project Number or other prefix to your whole project, including drawings (Optional: and sheet names) is done with only 2 or 3 selections, 2 pieces of information and 1 click. •Update all components to the new default Revision with a single click. The new Revision can be updated in all the new Components, including the Revision in the new Drawing Sheet names. •Update all components to the new default Issue Status with a single click. The new Issue Status can be updated in all the new Components. •Update Drawing Numbers in Components and Drawing Sheets. The new Drawing Numbers can be updated in all the new Components, including renaming of all Drawing Sheets to the new Drawing Numbers, new Revision included. •Superseded Revision Table rows removed. When Revision Tables are used all superseded Revision Table rows will be removed from the new Drawings and only 1 row is left for the new Revision and Issue Status. Save 100% of time by not having to rename Component by Component. Save 100% of time by not having to update the Revision Sheet by Sheet. Save 100% of time by not having to update the Issue Status Component by Component. Save 100% of time by not having to rename the Drawing Numbers Component by Component. Save 100% of time by not having to rename the Drawing Numbers Sheet by Sheet. Save 100% of time by not having to remove Revision Table rows Drawing File by Drawing File or Sheet by Sheet if option Active Sheet is used. Report a bug during your Trial Period and get a License and Subscription free for 1 year. 3.0.1.0 Weldments and Presentation added 3.0.0.0 Updated Version; New feature: adding a project number to files. Renaming options optimised. UI updated. It's useful when you have to replace 1 word in all parts, when you want to rename multiple files with different names, it's faster to do it manually.